When we met for the excursion, we were warned that the current was particularly strong that day and that swimming might not be possible, particularly for small children and/or weak swimmers. They offered refunds and we briefly considered it (our 10-year-old is not a strong swimmer), but finally decided that we probably wouldn’t want to do anything more than wading and, if the conditions didn’t even allow that, we’d still enjoy lounging on the beach and playing in the sand with our son. This turned out to be the right decision as we had no problems at all wading out a few feet and playing in the waves. My wife did wander out a bit too far and got knocked over by a wave at one point, but she was okay and we all quickly learned from it to stay closer to shore. 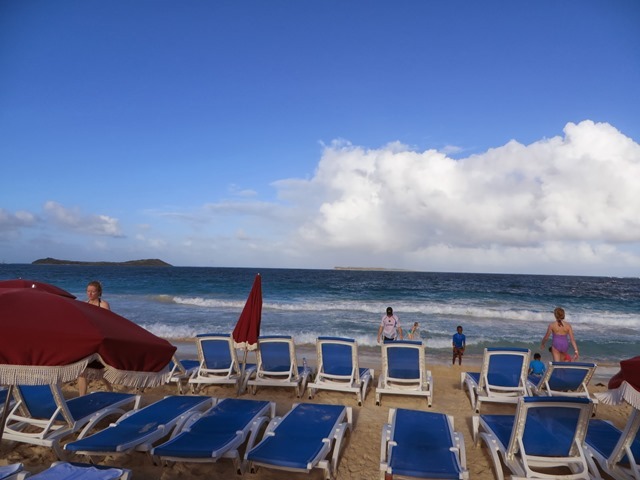 The excursion worked out well logistically as the excursion company had arranged for a section of the beach to be reserved exclusively for the cruise passengers on that excursion. It also included all-you-care-to-drink punch, either with or without rum (I had one of each). Transportation to and from the beach was in comfortable buses and included a narrated city tour. 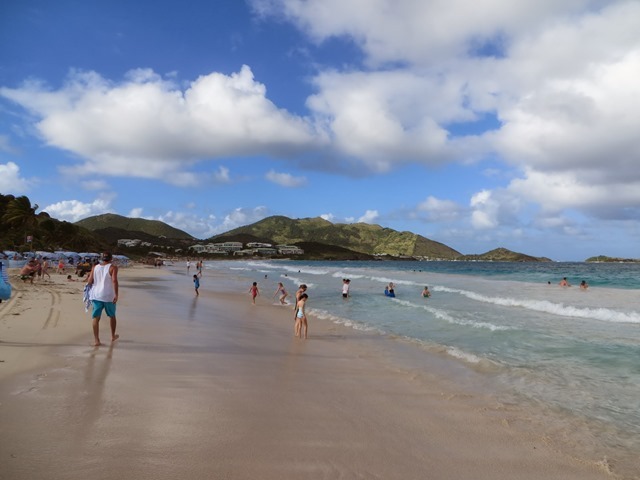 Our only major complaint was that the beach tended to be kind of a tourist trap, with vendors constantly coming up trying to sell jewelry or other trinkets. 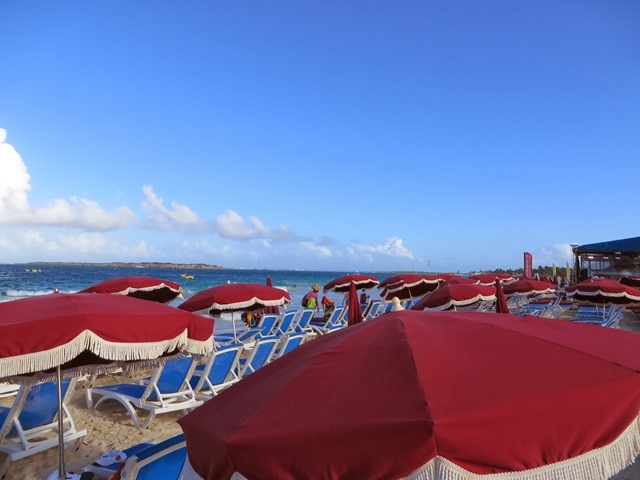 My wife also became very irritated about an up-charge for the use of beach umbrellas, which were already set up all over the beach when we arrived. If you sat down in a lounge chair under an umbrella (as she did), someone would eventually come up and ask for a $3 fee or take the umbrella away if you chose not to pay it. This seemed much more tacky than if they had either had a vending station where you could rent an umbrella (instead of having them already set up on the beach) or even just simply factored the $3 fee in the price of the excursion. When we got back to the ship late in the afternoon, it was time to get showered and dressed up for dinner. The 7-night (or longer) Disney cruises include one official formal night, and they had wisely scheduled it for New Year’s Eve. On the formal night, they recommend that men where a suit and tie (or even a tuxedo) and woman wear a dress or a nice pants suit. It isn’t something that is enforced or mandatory, and anyone that would feel uncomfortable in that setting has plenty of other dining options, but we did think it would be fun to dress up. We had recently bought a suit coat and slacks for my son to wear at a wedding he had been invited to a few months earlier, so this seemed like a great opportunity for him to dress up again. We were happy that the dining rotation worked out that we were at Royal Court, the most elegant and upscale of the 3 main dining rooms on the Fantasy. The elegant setting and formal dress all felt like a perfect combination for New Year’s Eve dinner. 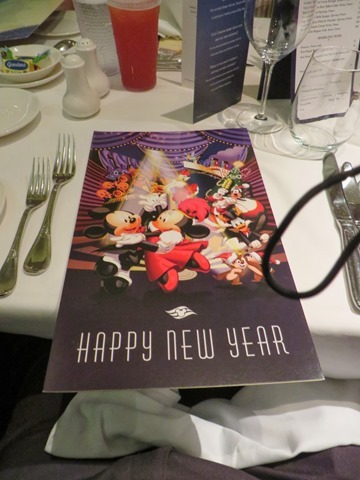 For the occasion, they even printed up special New Year’s Eve menus. Every dinner in the main dining rooms on the cruise is a pretty high-end affair with multiple courses of generally well-presented, upscale foods, but they did a nice job of making the holiday meal feel just a bit more special. Each evening after dinner (for those of us that had the early seating), there was a featured show in the Walt Disney Theater, the ship’s main performance venue. 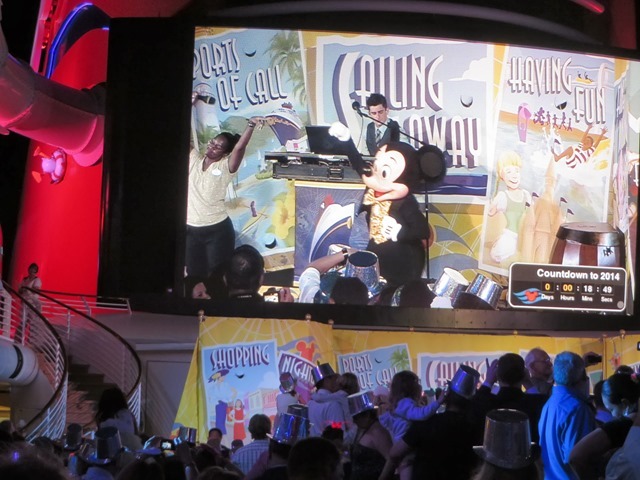 Most night’s there was a live stage show or some other live performance, but on the 7-night cruises they usually set aside one night for a showing of a current, still-in-theaters Disney movie. 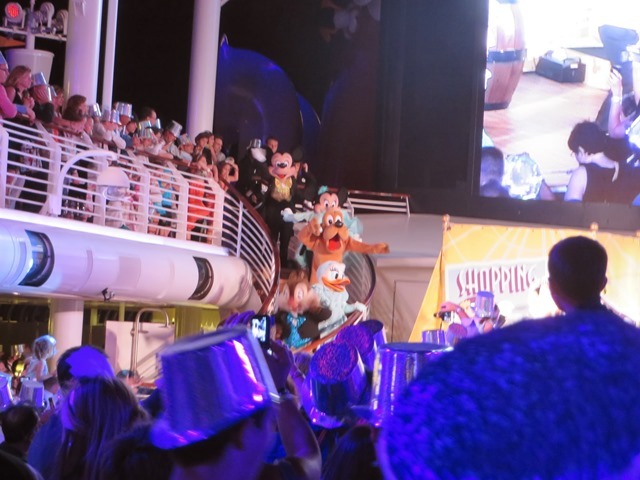 On this cruise, it was a showing of Frozen on New Year’s Eve. Although we had already seen the movie when it first opened in November, we had all loved it and were happy to see it again. Knowing that we would be staying up until midnight, seeing the movie seemed like a perfect way to keep us occupied for a few hours withou using up too much energy. There was also something kind of cool about seeing a movie in a fancier than usual theater while dressed in our formal clothes. 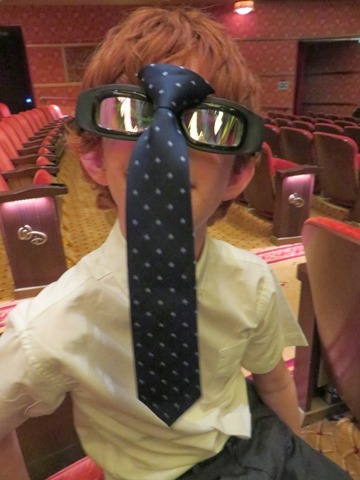 Of course, we couldn’t let things get excessively serious and, thus, ended up taking photos of my son wearing his clip-on tie on his 3-D glasses. After the movie, we walked over to the ship’s main atrium lobby, where they had professional photographers on hand to take photos. 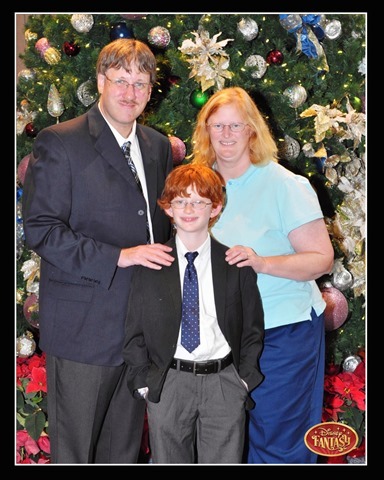 We specifically chose to have some pictures taken in front of the large Christmas Tree in the lobby, which seemed a particularly nice backdrop. I was already assuming we would buy a package of some of the pictures taken by the ship’s photographers and these pictures in our formal clothes on New Year’s Eve were ones we would be sure to want. After photos, we went to our stateroom to change out of our formal clothes before heading upstairs to the New Year’s Eve deck party. 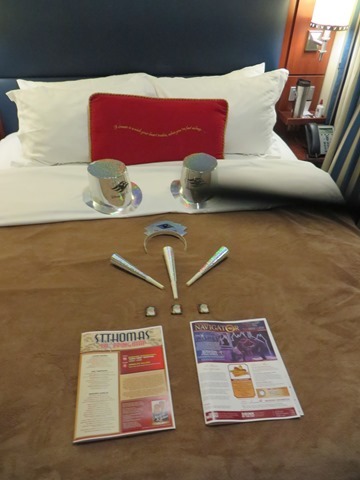 We found that the stateroom attendant had laid out noisemakers for each of us as well as Disney Cruise Line top hats for my son and me and a tiara for my wife. These were only the first of special New Year’s souvenirs provided over the next couple days. 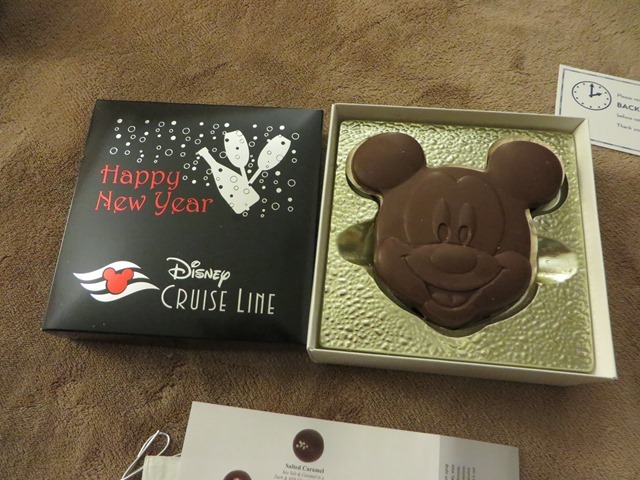 At the deck party, we would all receive Disney Cruise Line champagne glasses and then on the following two nights we received a New Year’s commemorative lithograph and a box of chocolates in a special New Year’s 2014 box. The ship provided a couple different options for celebrating the New Year’s moment, including events in the various night clubs and a balloon drop in the atrium lobby, but we never seriously considered anything other than attending the party up on the pool deck, which would include a fireworks display. We arrived up there between 10:30 and 11 and quickly saw the advantages of the limits on crowd size inherent to being on a ship. While the party was well attended, it was very easy to get around and to find good viewing spots to see the giant screen on the ship’s funnel and the stage beneath it. We even had no difficulty at all finding a deck chair off to the side for my wife, who has a back condition and would have had a hard time standing the whole time. I’m not sure exactly what time the deck party had started, but it was already underway when we arrived. At that time, there was a live musical act up on stage performing various pop song covers. When they finished, a DJ came out and continued playing energetic songs as midnight drew closer. Of course, they continuously had a countdown displayed on the funnel screen. 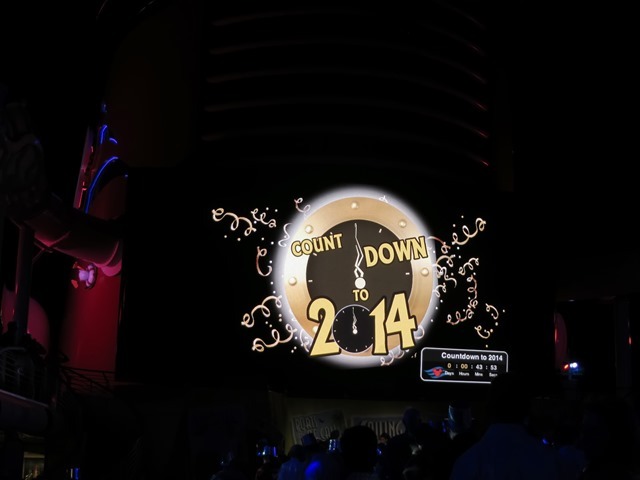 In fact, the countdown had been up on the screen all day. As I mentioned earlier, servers brought around souvenir glasses (well, actually plastic) with complementary champagne or sparkling cider as well as various snacks. Early in the cruise, they had distributed forms for ordering private bottles of champagne or cider and we had ordered a bottle of Martinelli’s. Although we did finish it off before retiring for the night, I’m not sure I’d bother ordering one in the future as the servers were offering complementary refills throughout the evening. 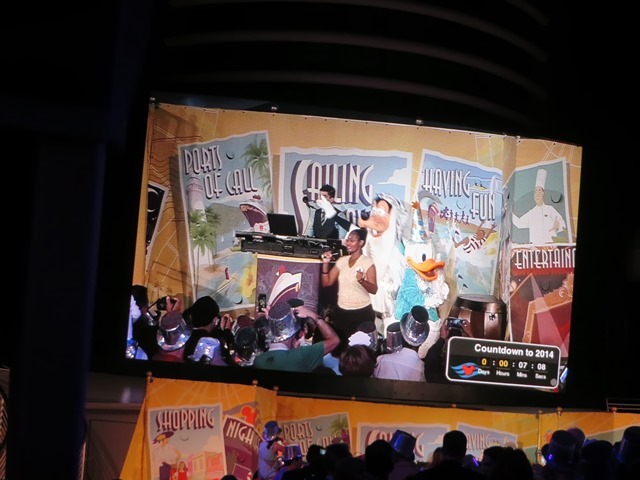 As midnight approached, numerous Disney characters, dressed in formal attire, started streaming out onto the stage for the countdown. When the countdown reached midnight, paper streamers were shot out into the crowd and then a short fireworks display started. While they can’t do a fireworks show at sea that is comparable to what you would see in one of the Disney theme parks, it still is pretty impressive seeing fireworks above the ship. 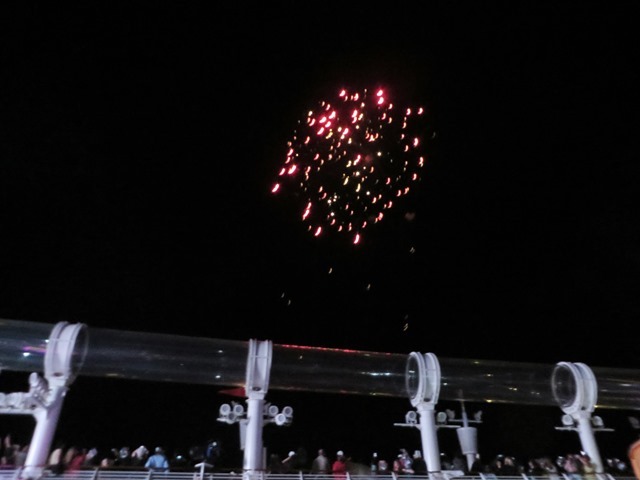 Disney offers a fireworks show on most of their cruises, usually during a pirate-themed deck party, and this has typically been promoted as a unique feature of their ships. After the fireworks display, the event was punctuated by the sounding of the ship’s horn, which plays a number of Disney songs. "When You Wish Upon a Star" was used for the midnight moment. In an amazing bit of timing, it started raining at approximately 12:03am and, by around 10 minutes after, it was pretty much pouring rain and most people started moving off to find shelter. We found a sheltered spot on deck to finish off our sparkling cider, then headed to the stateroom and to bed after a very full and exciting day. New Year’s Eve was only day 4 of the 7-night cruise, so we still had 3 more days left, including New Year’s Day at St. Thomas in the Virgin Islands. Not a bad day to start 2014 and I suspect this was a New Year’s Eve that we will have a hard time topping in the foreseeable future. I loved this article so much! Thank you! I have a question though; are all the Christmas activities still running on the New Years cruises? There’s a cruise this year (2016) that departs the 31st of December and I would love to have Christmas and New Years activities at the same time. I too would also like to know if the ship was still decked out in Christmas decorations. 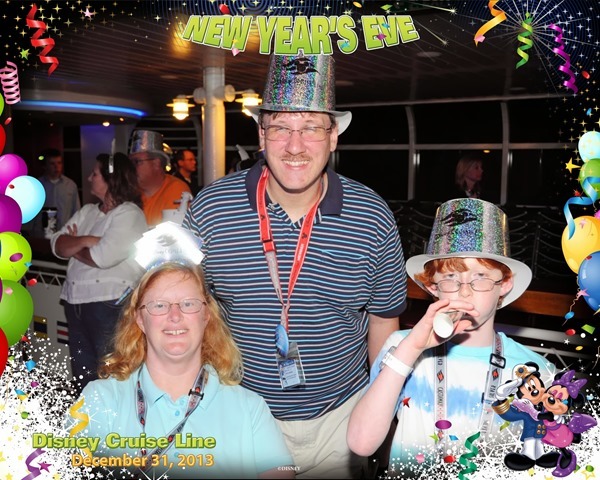 Sailing on a 2017 NYE cruise Dec 29 2017. Thank you. Yes, the Christmas decorations were all still up, although the various Christmas activities (Santa appearances, storytelling, etc.) were not done on the New Year’s cruise.